The President of India, Shri Pranab Mukherjee inaugurated the 200th anniversary celebrations of the Paika Rebellion of Odisha tonJuly 20, 2017 in New Delhi. The Paik Rebellion also called the Paika Bidroha was an armed rebellion against the British East India Company's rule in Odisha in 1817. The Paiks rose in rebellion under their leader Bakshi Jagabandhu and, projecting Lord Jagannath as the symbol of Odia unity, the rebellion quickly spread across most of Odisha before being ruthlessly put down by the company's forces. The Paiks were the traditional landed militia of Odisha. They served as warriors and were charged with policing functions during peacetime. The Paiks were organised into three ranks distinguished by their occupation and the weapons they wielded. These were the Paharis, the bearers of shields and the khanda sword, the Banuas who led distant expeditions and used matchlocks and the Dhenkiyas - archers who also performed different duties in Odisha armies. The Paik rebellion had several social, economic and political reasons. The Paiks were alienated by the British regime, who took over the hereditary rent-free lands granted to them after the conquest of Khurda. They were also subjected to extortion and oppression at the hands of the company government and its servants. Had conciliatory measures been adopted towards the Paiks from the beginning, it is possible that they would have become a source of strength to the company rule in Odisha. The extortionist land revenue policy of the company affected the peasants and the zamindars alike. A source of much consternation for the common people was the rise in prices of salt due to taxes imposed on it by the new government. The company also abolished the system of cowrie currency that had existed in Odisha prior to its conquest and required that taxes be paid in silver. This caused much popular hardship and discontent. In 1804 the Raja of Khurda planned a rebellion against the British in alliance with the Paiks, but the plot was soon discovered and the Raja's territory confiscated. 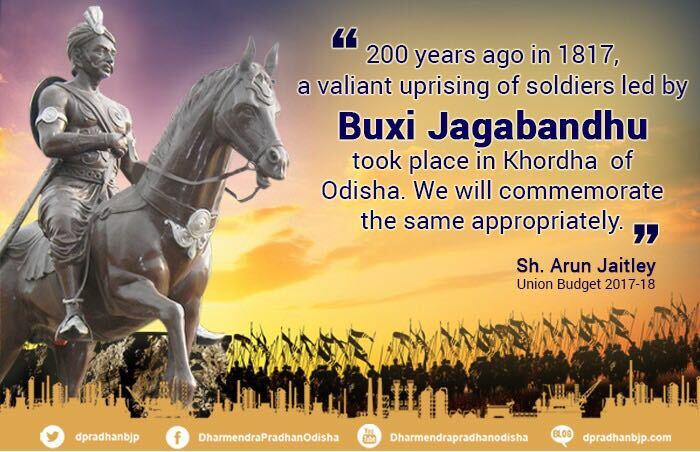 It happened 40 years before the revolt of 1857, which was later termed as 1st War of Indian Independence against British Colonialism, a battle was fought under the leadership of Baxi Jagabandhu of Odisha. Many scholars, researchers and historians have opined that the Paika Rebellion of 1817 was India’s first organized armed rebellion against British Raj.